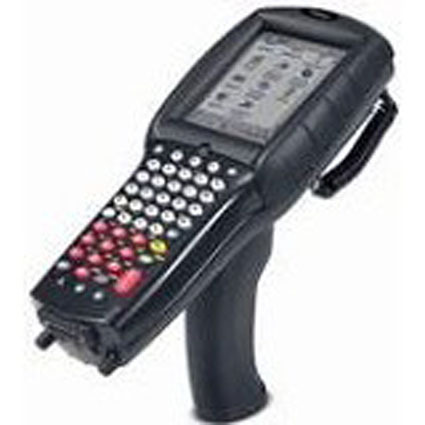 The Datalogic Falcon 4423 color mobile computer incorporates all of the features users are demanding today, including the latest in mobile computing technology from Microsoft, Cisco, and Intel, a wide variety of scanning options (Standard, Long Range, and Advanced Long Range laser scanners, linear imager, and a 2D imager), a large 3.5” QVGA color display, a 2000 mAh Lithium Ion battery, and an integrated handle. The Falcon 4423 with its overmolded enclosure is designed for warehouse, distribution center, and retail in store environments, where maximum performance is required in a rugged yet ergonomic form factor. The Falcon 4423 is available standard as a kit to simplify the ordering process. Kits include charging/communication cradle, power cables, and usb cable. Dimensions (W x D x H): 3.5" x 9" x 1.6"
Development Tools: Embedded Visual C, Visual C# .NET, Visual Basic .NET, Personal Java 1.1, Java Virtual Machine (JVM), Falcon® CE Developers Toolkit, Visual Studio 2005 and Wavelink® Studio.